Scientists have discovered that the properties of an ancient Egyptian blue pigment give it the ability to be the most energy efficient color for both light and heat reflection. Egyptian Blue, used thousands of years ago, is now being implemented to cool rooftops and walls. When you look at ancient rock art, like those in Tassili n’ Ajjer in Algeria, you may notice something about the drawings. The palette of these rock painters, and other ancient artists after them, had almost all the main colors, such as red, green, yellow, brown, and black, but lacked in blue hues because very few minerals are naturally blue. For those scarce materials that are available, often their coloring is short lived. It wasn’t until around 4,500 years ago that a blue pigment was invented, called the “Egyptian blue“. 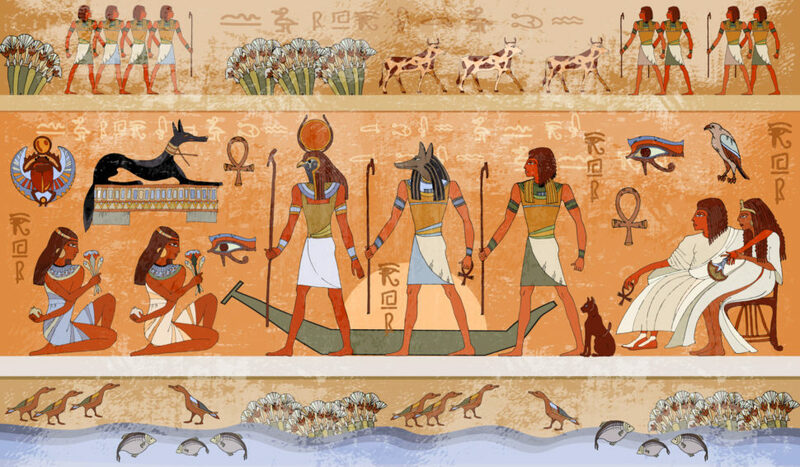 Ancient Egyptian chemists worked hard to make a lasting blue pigment, the color of the Nile and the sky, worthy to depict their deities and pharaohs. Thought to be the first ever artificial pigment, “Egyptian blue” remained in use for thousands of years across ancient Egypt, Mesopotamia, and the Roman Empire. It even reached as far as Scandinavia in the form of fashion accessories. Egyptian blue is another example of how art and science coexist and how one can facilitate the advancement of the other. Egyptian blue was widely used until around the collapse of the Roman Empire. Then, the pigment kind of disappeared from artworks until trade routes to the Middle East in the Renaissance period made the color popular once more. Now, Egyptian blue is making a comeback in ways that its inventors could never have thought of. The first synthetic pigment ever in human history, scientifically known as calcium copper silicate, has more to it than meets the eye. Chemists at the DoE’s Berkeley National Laboratory (Berkeley Lab) reveal the potential of Egyptian blue in energy efficiency. The color of the roofs and walls of buildings, especially in hot regions, affects their energy efficiency and cooling costs. White is the most conventional color used to reflect sunlight. However, from an aesthetic point of view, white isn’t that interesting. In 2016, Berkeley Lab researchers already demonstrated that fluorescent red ruby pigments could represent a better alternative to white. Now they show that Egyptian blue could be 10 times more fluorescent than previously thought. The Egyptian blue can be a much more effective alternative to white and red ruby pigments in boosting the energy performance of buildings. In addition to its cooling potential for walls and rooftops, the Egyptian blue could also be used to tint windows to generate photovoltaic solar power. Do you think scientists should be looking at more historical inventions for future inspirations?